After this long dreary winter, spring is set to arrive soon. The calmer weather will give us an opportunity to enhance the overall look of our home’s exterior. As the weather will get warmer and warmer with the passing days, many homeowners are now probably looking for ways to enhance their home’s curb appeal. 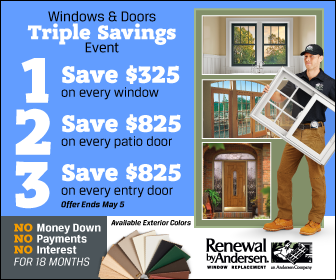 If you want your home exteriors to inspire second glances this spring, we at Renewal by Andersen® of St. Louis, a top Chesterfield Missouri windows company, suggest getting new windows. Updating your windows is a great way to boost the facade of your house this spring. In fact, investing in replacement windows in Chesterfield MO and other communities in the area can significantly affect the curb appeal and, consequently, the resale value of your home. New windows can help add to the appeal of any home, which can attract more potential buyers—that is, if you’re planning to sell your home. Otherwise, a pleasantly fresh facade is always a welcoming sight to come home to after a long day’s work. Aside from our wide range of window styles, working with our expert design team can also help you choose the right windows based on your style, budget, and, of course, the design and spatial constraints of your home. Further, we also offer a FREE estimate so you won’t have to worry about additional expenses. Just give us a call at (314) 332-2364 today, and we’ll talk about how we can improve your home’s curb appeal with new windows.